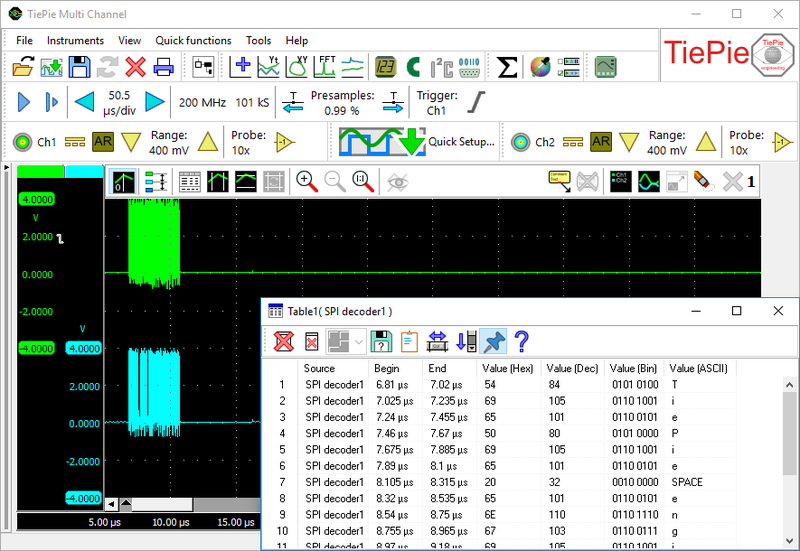 This TiePie engineering news covers the release of the latest version of the Multi Channel oscilloscope software, version 1.39. It gives an overview of the new features in the software and other improvements of the software. Additionally, it gives information on the introduction of a new differential attenuator for the Handyscope HS6 DIFF, the TP-DA25. This differential attenuator enlarges the input range of the Handyscope HS6 DIFF to 1000 V by attenuating the signal 25 times. Version 1.39 of the Multi Channel oscilloscope software is now available for download. Many changes have been made to add new functionality and to improve basic operations in the software. This is a categorized overview of some of the changes. An SPI decoder I/O is added, to decode analog data on an SPI bus to SPI data. Just measure the Clock and Data lines of the SPI bus with a scope and connect the measuring channels to the SPI decoder I/O. The output of the SPI decoder contains the decoded values, in hexadecimal notation, decimal notation, binary notation and in ASCII. The output can be shown in a table. Additionally, many SPI Quick Setups for all modes have been added. The Handyscope HS6 DIFF trigger system is expanded with a Trigger delay feature, which allows to measure a user defined amount of time after the trigger occurred. The measurement (re)start functions in the hardware are improved, resulting in a higher maximum update rate. The feature to log data using the Data Collector I/O, by setting its When full property to Save to disk and clear has been expanded. Besides saving the measured data, the Data collector also saves an index file keeping track of all saved data files of that measurement. When the measurement is ready, the index file can be opened in the Multi Channel oscilloscope software. This will load a block of two, three or four of the saved Data collector .TPO files, depending on the data length of the saved Data collectors. The loaded Data collectors are shown together in a graph. When the original setup contained multiple Data collector I/Os, the .TPO files with matching times will be loaded and displayed together. Additionally, a special toolbar is shown that allows to navigate through the available .TPO files that belong to the specific measurement. Additionally, data logging Quick Setups have been adapted to use the new feature. Several other minor changes and corrections have been made in the software, to improve controlling instruments and performing measurements. Command line parameters for exporting objects added. Added notification for user if the instrument start fails. Time/div controls are now disabled when instrument is in streaming mode. BugFix: Handyscope HS6 DIFF Enter/Exit window trigger didn't work properly. frequencies, measurements could not be started due to a failed synchronization. BugFix: Streaming with combined instruments didn't work for low sample rates if no channels of a sub instrument were used. 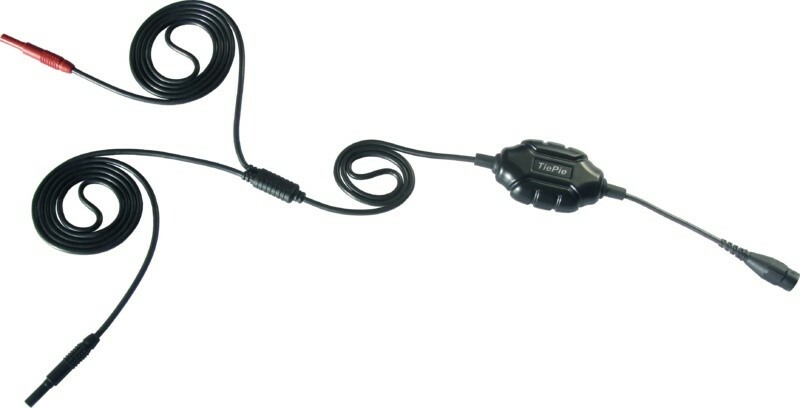 Due to the differential inputs of the instrument, a standard attenuator or attenuating oscilloscope probe cannot be used without introducing measuring errors. Instead a differential attenuator is required. The Differential attenuator TP-DA25 can simply be placed directly on the input of the Handyscope HS6 DIFF and the test probes directly on the 4 mm banana jacks at the end of the measure lead. The Differential attenuator TP-DA25 has a passive design and does not require a battery. The specially designed Differential attenuator TP-DA25 has a high Common Mode Rejection Ratio (CMRR), it is very insensitive to external interfering signals. The two ends with the banana jacks can be placed up to more than two meters apart, while picking up very little interference. With a conventional oscilloscope with a standard oscilloscope probe this is not possible. The maximum distance between the positive side and ground is then usually limited to approximately 20 cm. And this 20 cm is very susceptible to interference. The Differential attenuator TP-DA25 for the Handyscope HS6 DIFF does not have this disadvantage. External interference is very well suppressed by the special construction of the Differential attenuator TP-DA25. Measuring between two distant points is now possible. More information, including detailed specifications, can be found at www.tiepie.com/TP-DA25.